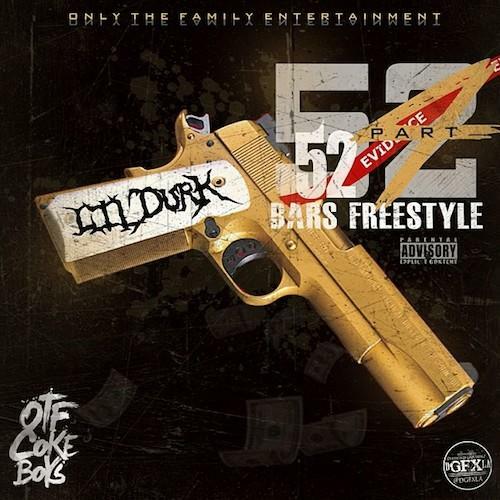 Lil Durk got "52 Bars" for the streets. It's been a minute since we heard a new track from Lil Durk. The Chicago rapper has been busy with the visuals lately, as he was recently featured in WSHH's original documentary and Noisey's Chiraq documentary. He also just dropped his own music video for “Times” at the top of the year as well. But the streak of visuals ends there as Durk decided to offer up some new music for the streets today. He gives us the 4th entry to his "52 Bars" series and its two and half minutes of straight heat. Track produced by Dree The Drummer. Give it a listen, or five. Lil Durk's new mixtape, Signed To The Streets 2, is on the way. Stay tuned. "Police lookin', pool so slicky/ Murder scenes on your block like movies/ Gang of robbers in Chicago, I never seen some boys tell Oozies/ Keep my gun, on my son/ My niggas they one of one"